I had the opportunity to become a member of the “Dude family” over 6 years ago and today I’m proudly a Senior Client Success Advocate on the Success Operations team. My job is to proactively work with our clients to help make sure they are armed with all the resources and knowledge they need to be successful with their SchoolDude solutions. You may recognize my name (or voice) from the monthly SuccessOps webinar series or from SchoolDude’s very own podcast. I look forward to working with you to help make sure your school is fully optimizing your online solutions! Did you know that small schools make up 85% of America’s schools? Occasionally we hear those of you who fall into this category say, “We’re too small to leverage SchoolDude”, but we’re here to tell you today, that you’re not too small. SchoolDude delivers a tremendous value to over 2,100 “small schools” across the nation; in fact some of our greatest success stories are from schools with as few as 50 students! In 2013 we commissioned a K-12 survey with TechValidate and polled our client base and confirmed what we already believed and stood by…. that small schools, aren’t too small for SchoolDude. We’re passionate about small institutions because we understand the challenges you’re facing day in and day out and while we know we can’t add extra hours to the day, we can provide you with the tools to increase efficiency; tools that will work smarter, not harder. How are schools achieving this cost savings? They’re increasing efficiency by streamlining and automating the work flow process. They’re cutting down on time spent on phone calls, emails, etc. by automating communication --- all while increasing transparency at the same time. They’re staying ahead of the game; by documenting preventive maintenance, they’re spending less time on critical system failures and extending the life of high-ticket items. 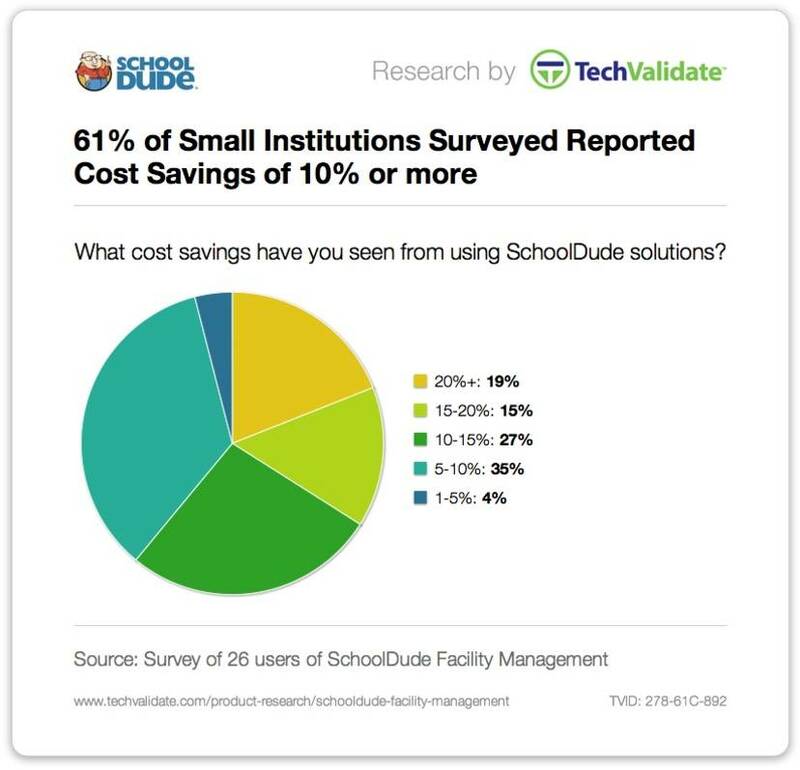 What could those cost savings mean to your small school? New smartboards, new playground equipment, or maybe even a new teacher? That equates to: 12 hours per month, 144 hours per year, equaling almost 1 month in time savings in a single year! How are schools achieving these time savings? They’re leveraging the MySchoolBuilding portal.Bringing requesters on-board empowers faculty and staff to take ownership of submitting their own requests, cutting down on interruption time for staff. They’re automating the workflow process.Requests can be accessed for approval, assignment, or completion anywhere by the click of a mouse, eliminating the need for the maintenance team to constantly report back to the maintenance office to receive their next task. They’re automating communication.Email notifications are automatically triggered to notify an approver that they have requests waiting for review, emails are automatically triggered to notify someone that they have a task waiting for them, emails are automatically triggered to the requester to keep them updated on the status of their request whether it be a work order completion or an approval for facility usage. 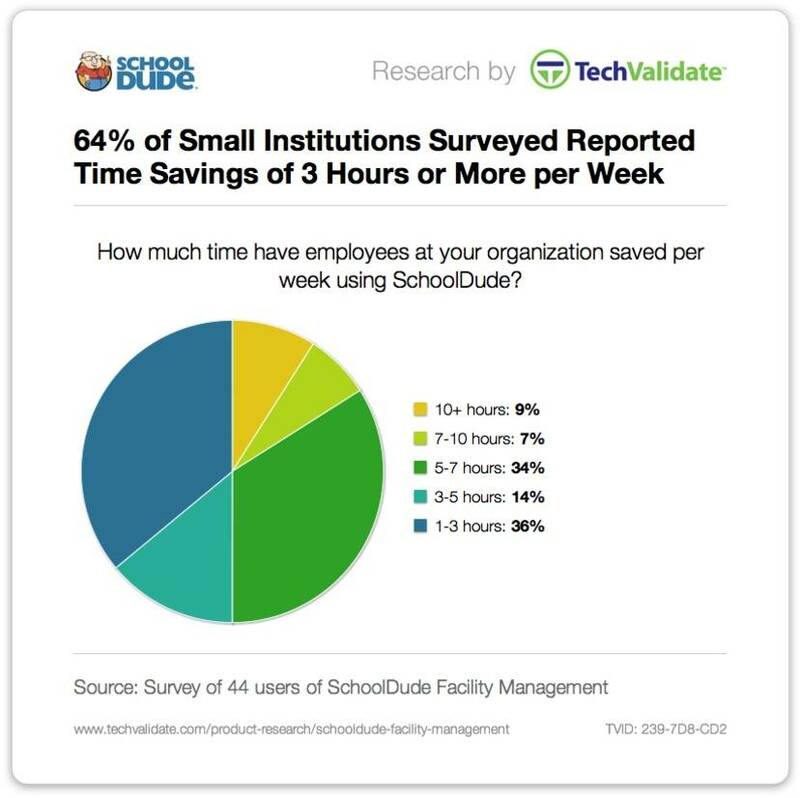 To learn more about why SchoolDude is the perfect fit for your small school, check out our recent webcast, “Small School Webinar: You’re Not Too Small”. To learn how to achieve more from your current SchoolDude applications, make sure to stay plugged into the SchoolDude Community to access helpful resources, take part in great discussions, or contact our Legendary Client Service Center today! Kimberly Norton is a Senior Client Success Advocate for SchoolDude and has been a proud member of the "Dude Family" since early 2008. Kimberly has the opportunity to work with our clients closely to help make sure they successfully implement their SchoolDude solutions.